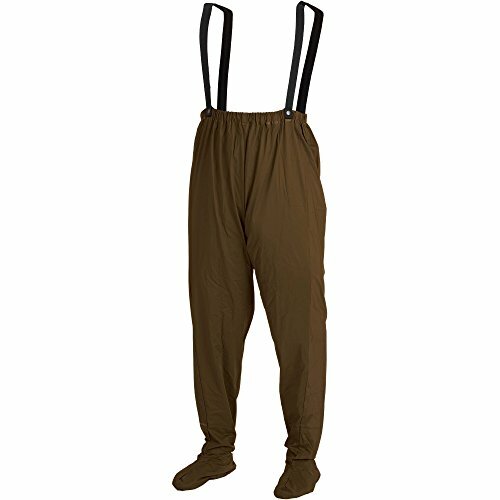 Hip waders are basically boots that rise up to your hip level. They're also known as 'hip boots' and frequently employed by fishermen and hunters so that they can wade into deeper waters while on the hunt. Our top pick is the Hodgman Mackenzie Fishing Waders. They've received primarily positive buyer feedback in our research. When donned, they rest just above your chest and, for the most part, buyers say that they're water proof. The only problem is that if the boot fit is tight, they have a tendency to uncomfortably compress in deep waters and pinch your ankles. Hip waders or hip boots are boots that cover the entire leg, and sometimes go up to the chest. 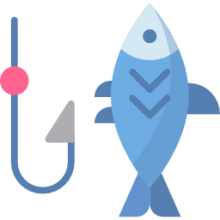 They’re used mainly for fishing, such as fly fishing, allowing fishermen to wade out into the water and remain dry (Source). Most hip waders are made of rubber or PVC or a combination of the two. These materials are waterproof and designed to keep you dry when wading into high water. Most buyers suggest, when looking for hip waders, to look for materials that are 3.5-5mm thick for durability and better insulation. Also, most people wear these for long hours, so look for something that’s breathable. Lastly, look for a pair that is easy to get on and take off (Source). We took a look at 5 popular hip waders and note the features and what buyers thought. The Hodgman Gamewade PVC Packable Chest Wader is 25mm PVC material and features an interior storage pocket, elastic webbing and shoulder straps that make them easy to get on and take off. Includes a storage bag for easy packing. Some users said the legs run long, which causes a lot of bunching up, which can be uncomfortable for shorter people. Also, these aren’t insulated, which means they won’t keep you warm in cold weather. Next is the Allen Company Dillion 2 Ply Camo Hip Wader Boot, which features the Realtree Max-5 camouflage design for a great look, and cleated soles on the boots for extra grip on slippery surfaces. Users say these waders are very comfortable and can be worn on long fishing trips, however, they’re too thin for cold weather. Best used in spring and summer. The Hodgman Mackenzie Nylon and PVC Cleated Bootfoot Chest Fishing Waders are a bit different than the others in that these go all the way up to your chest. While waders like this can often be heavy and uncomfortable, these weigh 35% less than other similar waders. Cleated boot gives you a better grip on slippery surfaces. Some buyers say these waders are water repellant rather than waterproof, though. Next is the Frogg Toggs Rana II PVC/Nylon Hip Waders, which also feature a cleated boot to help when things get slick. Also, like the other waders we looked at, these aren’t insulated and are better suited for warmer temperatures. These hip waders employ adjustable belt leashes with quick-release locking buckles, which makes them easy to get on and off. Some buyers felt the soles were too thin and uncomfortable for walking on rocky surfaces. Last up is the Allen Black River Bootfoot Hip Waders, which use a 2 ply construction to ensure the water stays out. Like other hip waders we looked at, these also feature a cleated sole and the boots are a bit more sturdy and durable compared to the other waders. Of all the hip waders we looked at, these got the highest marks from buyers for not leaking and being long-lasting (Source). The Allen Company hip boot waders could be a solid option if you are looking for sturdy, durable boots. Users love the functionality of these boots, but some do complain about the thin shoe portion. This product features two-ply upper construction made of rugged nylon, which is said to be lightweight with a waterproof membrane. Other useful features include a cleated sole, an integrated belt loop, and a take-up strap. This item might be a solid choice if you want hip waders that are designed to keep you warm and dry. In general, buyers have a very favorable opinion of the Allen Company Black River flyfishing wader pants. They agree that the rubber pants are comfortable, durable and easy to get into. Users conclude that they are a good value for the money. Purchasers suggest buying one size bigger than your feet so that you can put liners in them, otherwise, your feet will be very cold. However, some purchasers do complain about the shoe portion which is not reinforced at all, which makes the boots not very suitable for walking over rocky terrain. If you are looking for hip waders, you might want to consider the Frogg Toggs PVC/nylon hip wader. Users like the sturdiness of these waders, but there are complaints regarding the thin soles. These non-insulated molded PVC boots with cleated outsole are said to provide dry durability that handles the toughest work with ease. They feature nylon-reinforced PVC uppers with waterproof welded boot attachments and waterproof taped seams. According to the manufacturer, the adjustable poly-webbing belt leashes with quick-release locking buckles and elastic stride flex are there to ensure your waders remain securely in place. This item could be a solid choice if you need are liable protection from moisture while you’re afield. In general, users state that the Frogg Toggs hip wading pants with cleated sole meet their expectations. They agree that the waders are lightweight yet sturdy. Users appreciate that they are comfortable and have good traction. However, buyers do complain that the soles are too thin and that every rock you step on can be felt. If you’re looking for top-rated hip wading pants, you might want to consider the Hodgman Mackenzie nylon and PVC cleated bootfoot. Users love the handiness of this accessory, but some complain about its durability. 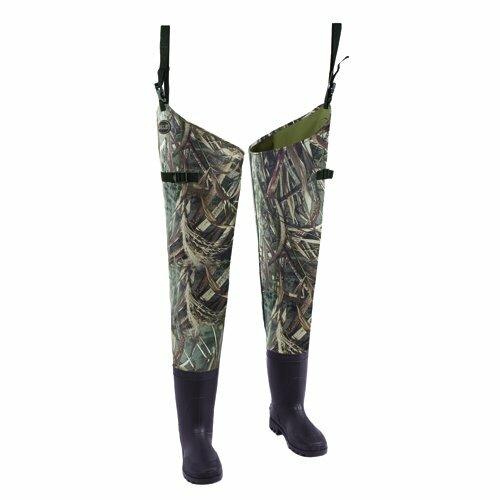 These hip waders are made of rugged heavy denier PVC coated nylon, which is said to keep water on the outside of your waders. As the manufacturer boasts, they are 35% lighter than the traditional rubber chest waders. This item might be a good choice for individuals who want more flexibility and a lightweight protective garment when off fishing. The general user consensus concerning the Hodgman fishing waders is that they are lightweight, yet strong. Purchasers appreciate that they are well-made and comfortable. They conclude that the item is a great value for the price. However, some buyers share that a leak formed where the boot attaches to the nylon material after a couple of uses. The Allen Company Dillon 2ply hip wader boot is a solid option for fishermen who want to keep themselves comfortable and dry. Users like the lightness of this fishing accessory, but some complain about its quality. These hip waders are made of rugged waterproof polyester fabric. They feature cleated boot foot soles and an adjustable belt strap. This product might be a solid option if you are looking for hip waders that will provide sure footing in a multitude of surfaces. The general user consensus concerning the Allen Company hip waders is that they are well-made, very comfortable and lightweight. They appreciate that the waders fit great and conclude that the item is perfect for spring fishing. However, some buyers complain that the waders are cheaply made. As one disappointed online reviewer says, the waders are very thin and the boots have no stiffness or body. The Hodgman PVC packable chest wader is a solid option for someone who wants versatile waders. Users like the usefulness of this fishing accessory, but do complain about them being leaky. 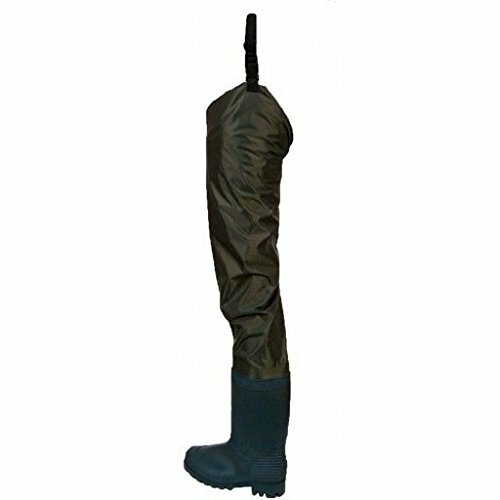 These hip waders are made of a 25mm PVC waterproof material. According to the manufacturer, they feature easy-on-and-off shoulder straps which are constructed from elastic webbing to move with you. 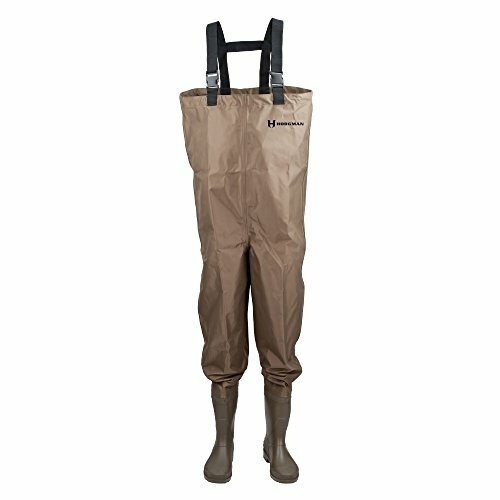 The waders are available in two sizes and come with a PVC pouch. This item seems like a solid choice if you want a quick, light-use wader shell when you are on the go. There are mixed reviews concerning the Hodgman PVC hip waders. Users agree that they are lightweight, comfortable and fit great. However, many buyers complain that the waders are very thin and that they are not designed to last, i.e. that they will leak eventually. In addition, some online reviewers share that the item they received had a hole in the foot and leaked immediately after entering the water. Whenever I go out for fishing in the streams and rivers in my location, I always make sure to wear chest or hip waders, which I decide upon after assessing the type of day it is (cold or hot) as well as the depth of the water I will be fishing in. If my chosen spot for fishing consists of slow moving and shallow water, then I wear hip boots, and if the water is deep and moving faster, I wear chest boots. Just to be on the safe side, whenever I go fishing, I bring along both my chest and hip waders so that I'm always prepared for whatever condition the water will be in and whatever the weather will be like. I make this preparation because I had a bad experience once when I made the mistake of bringing only my fly fishing hip waders while going to fish at the Barneys River. To my dismay, when I got there, I found the water to be fast moving and deeper than I had expected it to be. Although I had a walking stick to help me cross the river when I needed to, it wasn't much help when I accidentally stepped into a deep hole with my right foot. I fell down in the water and my hip waders got flooded with water, and my camera, cell phone, wallet and other things that were in my pocket also got completely soaked. It was at this point that I made the decision to get chest waders to deal with fast moving and deep water. The point of my retelling of this incident is to stress the importance of having the right kind of waders for your wade fishing excursions. I will now list down some of the available options for you depending on your personal preferences, about which kinds of waders you should get, depending on your requirements as well as your budget. There are two basic kinds of waders, namely, chest and hip waders. They can be made out of a variety of materials. For wading in shallow waters, hip waders are the designated waders as they are short and have the design of a boot. This also helps in hot weather. On the other hand, chest waders are similar in design to pants and they include suspenders or straps that are affixed over your shoulders, holding the chest waders in place. Whenever you are wearing chest waders, you should also wear an outer belt at your waist-level in order to keep water out of the wader in case you slip and fall into water. Chest waders are perfect for wading through water that is deep and fast moving and they are also great for added protection during the cold season. Another thing to take into consideration is the type of foot-design of the waders that you are going to be wearing on your fishing trips. The wader models that are designed like boots have a boot section, which is basically a heavy-soled boot, and it is constantly attached to the upper portion of your chest or hip wader. These boot-foot waders are more easily removed as compared to stocking-foot waders. They also provide the warmest option, waders-wise, in cold weather. The stocking-foot model style of waders needs you to have boots that are separate. In the stocking style foot wader, the foot section is placed inside specially made wading boots or shoes. This type of wader is typically not as warm in cold weather and cold water and in order to combat the cold, you will have to wear an extra pair of over-socks to prevent the wader foot from rubbing against your boot. Some waders are made up of such materials that they provide a great way for the waders to get rid of your accumulated body heat. They also allow your sweat to get released and they also act to keep out water from the outside. These types of waders are not insulated and are perfect for fishing in hot-summer weather. However, keep in mind that these kind of breathable waders are not form fitting, so if you feel a chill in your lower body area, you should wear warmer clothing underneath in case of colder weather. The best type of waders that are useful in cold weather by keeping your body heat insulated and preventing it from leaking out, are waders made from neoprene. Neoprene waders consist of the same material that scuba diver's wetsuits are made up of and they have seams that can be sealed to make them completely water proof. If you are fishing in warm or hot weather, then neoprene waders would not be a good choice, as they will keep all the heat in. Instead, in hot weather, you should wear breathable waders. Another common material that waders are made up of is rubber. These waders have the advantage of being easily available at most stores and also are more economical than the alternatives. However, before purchasing rubber waders, keep in mind that they are generally heavy, stiff and bulky. You can also start feeling clammy while wearing rubber waders because rubber is not a breathable material. There are better quality rubber waders available that have tennis shoe style designs and their air grip outsoles allow for greater overall comfort while wearing them and also provide a lot of traction to help you stay balanced while walking in water.